George Hogart studied law in Edinburgh. He married Georgina Thomson on 1 Jun 1814. At a certain time he was Sir Walter Scott's legal adviser. In 1834 he met Charles Dickens when they both worked for the Morning Chronicle. Later he was the editor of the Evening Chronicle, for which Dickens wrote articles. In 1836 Hogarth's daughter Catherine married Dickens. Between 1846 and 1866 he was music critic for the Daily News. Between 1850 and 1864 he was Secretary of the Philharmonic Society. 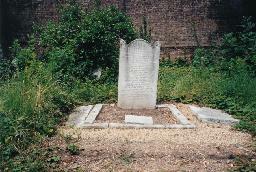 The grave of Mary Scott Hogarth and George Hogarth at Kensal Green Cemetery, London.